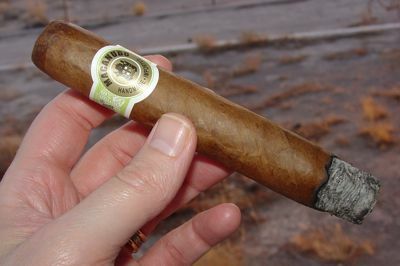 Macanudo is reportedly the best-selling premium cigar brand in the United States; it therefore needs no introduction. Just about everyone who has smoked a cigar has smoked a Mac — it’s a mild cigar with a classic Connecticut shade wrapper, and it’s a great one to give to a virgin smoker who is curious about the lure of the leaf. There are well over two dozen frontmarks of the Cafe blend alone, not to mention the several other blends that fall under the Macanudo umbrella. Recent blends such as the Macanudo 1968 and the Vintage 1997 have surprised grizzled veterans with their flavor and strength, showing us that Macanudo is not always synonymous with mild. These are the original mild-mannered cigars that so many know so well, but in a new format. (Yet another frontmark. It occurs to me that an average-sized cigar shop housing all of the Macanudo blends and sizes would have no room left for any other brand.) Super large ring gauges are finding followers and selling well, so it’s no surprise that General Cigar is responding to the demand with the new Gigante frontmark. The Cafe blend is the classic Mac, possibly the most consistently made cigar on the planet — a Connecticut Shade wrapper, a Mexican binder from San Andres, and filler from the DR and Mexico. 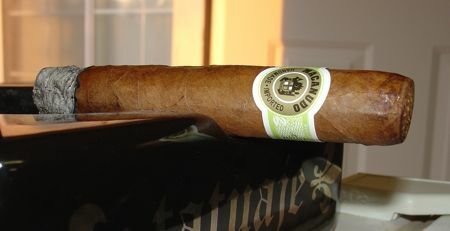 The Maduro substitutes a Connecticut Broadleaf wrapper for the Shade. The draw, burn, and consistency of the Macanudo Cafe and maduro brands is beyond reproach. If you’ve ever smoked one that didn’t burn well, leave a comment, because I have yet to hear from anyone of a construction defect in this cigar. It must have happened some time — it’s a hand made product, but it’s remarkably consistent. The Macanudo Cafe is a mild cigar with flavors that are typical of Dominican and Mexican tobacco — the base flavor is nutty with a little bit of astringency, just enough to work the salivary glands a bit. The Maduro version is somewhat sweeter. The broadleaf wrapper disguises the tartness a little more effectively than the shade wrapper does. There isn’t much transition from the beginning of this smoke to the end, but this is normal for very mild cigars. The Cafe does get a little more tart at the end, and the Maduro picks up some char, but mostly what you get out of this cigar is a mild-mannered vehicle for a couple of great wrapper leaves. The aroma is what makes this cigar noteworthy — the soft floral creaminess of the Cafe, and bittersweet chocolate from the Maduro. 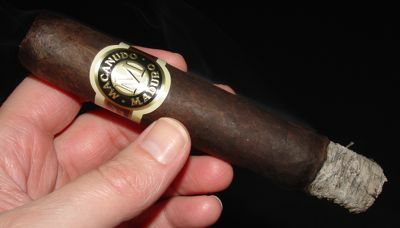 These are the same Macanudos that a lot of us started on, just in bigger sizes. And because they are so mild, the bigger size seems to be less of an extravagance than it does in many other blends. Mild cigar aficionados will definitely want to try these out, but don’t look for any big surprises. These are the same consistent smokes that they’ve been for many years now. MSRP is in the $6-7 USD range. I nevr have had a burn problem but I’ve had overly tight draw frequently. However, this was on a much narrowere ring size.